Alexandra Keys, Leila Dimaghani, Anthony DeCarlis and Christina Mowrey in "Intimate Conversations"
Michele Cox and Christina Mowrey in "Rapport"
To Purchase a CD-ROM proof disk for this show click here . To Purchase other CD-ROM proof disks click here . 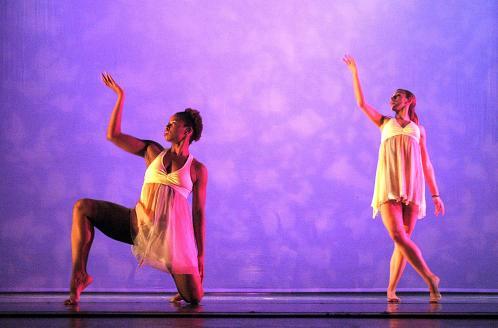 At 7:30 pm on Friday, Sept. 4th, the annual Choreofest concert was presented at White Recital Hall. It opened to a small but very enthusiastic audience, which grew in numbers for the subsequent performance on Saturday. The audience was treated to a variety of cutting-edge works that push the envelope on what most people expect in dance performance. Interestingly enough, this year's concert seemed to manifest an overall theme of gender politics. Although this theme was not by design, it was fresh, edgy, and intriguing, and clearly reflected the contemporary perspectives of some of the new young faculty members. The concert opened with a very traditional female ballet ensemble, "Allegro Assai," choreographed by Paula Weber and set to music by Mozart. 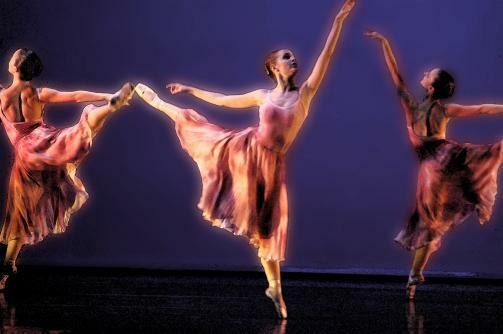 Dressed in pink dresses on a blue background, the ballet was lilting and fresh, and well executed on Pointe by the student cast. 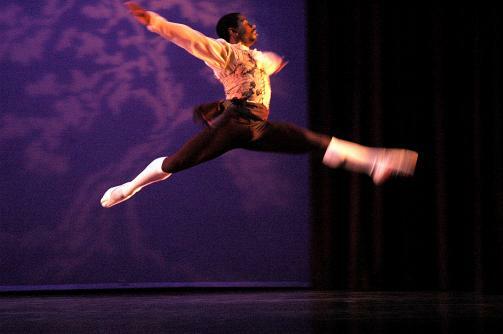 The next piece, "Rapport", was choreographed by Rodni Williams to "Brown Baby", composed by Toni Braxton. The piece also had the added feature of its music performed live by vocalist Lee Langston, Pianist Isaac Cates, and well-known Jazz sax-player, Bobby Watson. Dressed in empire dresses, the barefoot Modern piece was performed by Michele Cox and Christina Mowrey. The piece seemed to explore race and gender issues, in the choice of music and choreography. 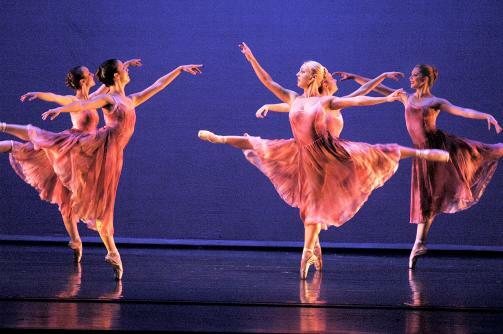 The choreography used a number of lifts and interactions not usually associated with female duets, demonstrating female strength not often seen in classical choreography. The audience responded well with hoots and hollers, appreciating the choice of music blended with innovative moves, and executed by accomplished artists for a collaborated effect. The singer for this piece, a god-brother to the choreographer, was a big hit, and people clustered around him to congratulate him during intermission. "I was delighted to be involved in this collaboration," Langston was overheard saying during intermission. "Rodni's like a big brother to me..."
Mary Marshall in "Pas de Trois"
Anthony DeCarlis in "Pas de Trois"
The next work was a classical ballet "Pas de Trois" from La Ventana (1891), set to music by composer, Hans Christian Lumbye. The original choreography was done by Augustus Bournonville, and was reconstructed for this performance by Dance Director, Mary Pat Henry. A romantic and classic ballet, it was done in traditional ballet costume by Tia Birdsong, Anthony DeCarlis, and Mary Marshall. The work was full of moves that were extremely athletic and a number of challenging steps for all three dancers, but all were very adeptly executed, clearly showing that the dancers at the Conservatory are able to master all dance forms. Leila Dilmaghani and Bobby Watson in "Intimate Conversations"
The next number was an excerpt from last year's very successful collaboration with Jazz saxist, Bobby Watson, "Intimate Conversations". Choreographed by Mary Pat Henry to Duke Ellington's "Don't Get Around Much Anymore", this crowd pleaser explores the humorous romantic interludes of couples vying for each other's attentions in a smoky bar scene. The audience chuckled and clearly enjoyed the athletic antics of the dancers, as well as Bobby Watson's performance in the piece. Ron Belger, Leila Dilmaghani, Alexandra Keys, Anthony DeCarlis and Christina Mowrey in "Intimate Conversations"
"It has been fabulous so far... the dancers are on their legs, the music is wonderful... Mary Pat Henry and the rest of the faculty did a great job pulling it all together," commented Cat Johnson, a freshman Dance Major, during intermission. After intermission, the concert opened with an abstract, quirky modern piece for sextet, called "Manipulated Living", choreographed by Jennifer Medina, and set to music by composer, Brian Eno. This was a structured improvisational piece that was polished for concert performance, and featured many non-sequitur elements in costume, music, and interactions. Dancers interacted, or not, and reconstituted themselves in different combinations and assemblages to music that had a New Age feel to it. The piece definitely seemed an abstract, hepatic, and experimental piece. "My process is so bizarre when I am creating," said Medina. "Sometimes I don't know exactly what the piece is actually about until I am actually into it... and it sort of reveals itself to me." Male ensemble explores masculine space in unusual contemporary piece "Come Together." 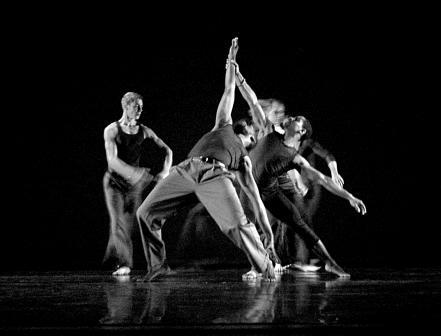 The next piece was an unusual presentation of choreography for a male ensemble. 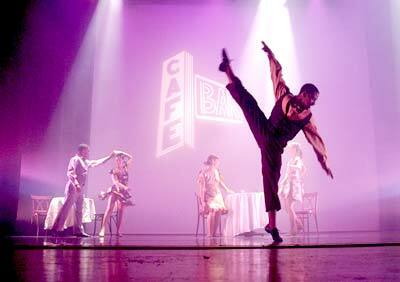 A Jazzy barefoot piece, dancers were dressed in street togs and stripped bare to the waist. Set to music by Phillip Glass and Crosspulse, the piece got its title from the Beatles' classic song, "Come Together". 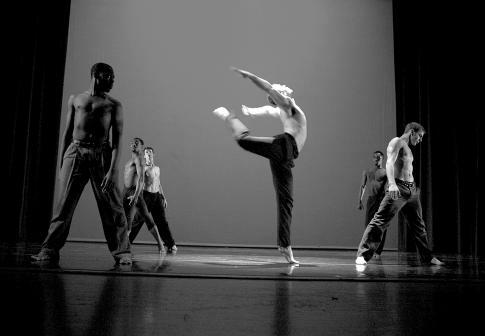 Choreographer Sabrina Madison-Cannon used the work to explore the male gender space in contemporary society. "It is about men, being men, in a man's world... but from a female perspective: mine �!" said Madison-Cannon. "I told the dancers to find the meaning of maleness for themselves in this piece... what it is to be men... resulting in a wide range of levels in the piece... men exploring the male space... men reacting to each other, other men." 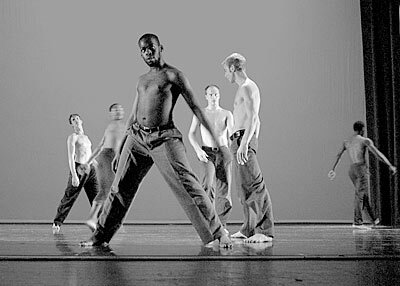 It was refreshing to see choreography that featured a male ensemble, and explored masculinity. 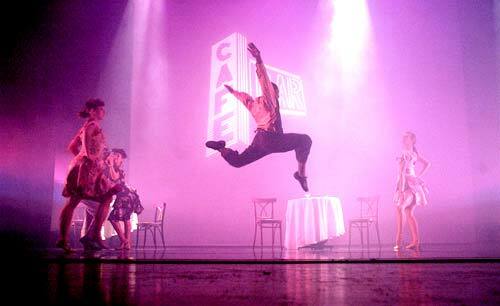 The moves were athletic, rough and tumble, yet very aesthetically pleasing on stage. The number was very well received by an enthusiastic audience. 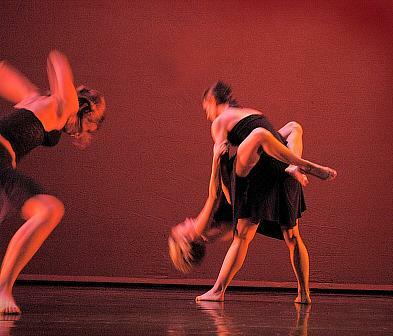 The last work was a long modern dance suite, choreographed by Jennifer Medina, and performed by a large female ensemble. This work featured a number of feminist themes in subtle ways, and was set to a variety of forms of music, including Jelly Roll Morton, Martina Topley Bird, Gustaro Santaolalla, Nina Simone, and Dr. John, whose song, "I Walked on Gilded Splinters", gave the piece its name, "Walk on Gilded Splinters". "The splinters represent high-heeled pumps... one of the symbols of female objectification," said Medina. "All of my dances deal with the experience of women... this one with waves of history highlighting changes in female roles in society and the symbols of the objectification of women, in general." She points to three waves of feminism and how women are viewed at each juncture. She explained the three points of history in feminism that she highlighted. "The first wave, as symbolized in the music, is from 1848-1921 when women get the vote," said Medina. The second wave represents the 1960s feminist demonstrations, represented by barefoot dancers in sleek, unencumbered attire... and the third wave looks to women now and into the future... the women of the future are always carried by the women of the past, which is also represented in the choreography. The choreographic work in this concert was particularly intriguing, not only for its variety, but for its presenting of dance as an art form that can present social commentary, just as other art forms can. Unfortunately, dance is not usually viewed as being an art form with feminist or political themes. This concert is evidence that dance can be both entertaining and profound at the same time, and in a collaborative manner. Live performance can make the experience of the work much more immediate. "I enjoyed the dynamic differences of watching the dancers perform with live music... the dynamics are completely different with live music," said Christina Walker, part-time dance student and Conservatory Music grad student pursuing MM in Music Theory. "It is nice to see how the two live performances combine for an overall effect."